Dwarf Korean Lilac (Syringa meyeri 'Palibin') is known as a compact but spreading plant. It is smaller and denser than other Lilac bushes. The Dwarf Korean Lilac blooms heavily in mid to late spring with dense, showy clusters of pale lilac flowers that are spread over the entire canopy. This variety is very fragrant and begins blooming at an early age. With a mature height of 4-5 feet The Dwarf Korean Lilac is so versatile. It can fit in tight places and small gardens. A great choice for a foundation plant because it won’t block windows. It is also very tolerant of pollution making it a perfect choice for an urban garden. The Dwarf Korean Lilac is cold hardy and easy to grow. It is also adaptable to most any soil conditions. If you love lilacs but thought you didn’t have room for one the Dwarf Korean Lilac is for you. 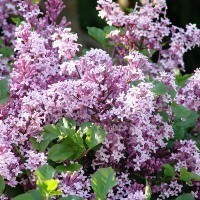 Now you can enjoy the captivating fragrance of lilac in a small yard or even in a decorative planter. Their compact size makes them a great selection for any garden or small landscape. Currently shipping as 1-2 foot bare root plants.